Endpoint Security for Endpoint Manager Level up on protection with sophisticated endpoint security management. Face it, your patching process is broken. Here's how you can fix it. Don't become ransomware's next victim. See the eight scariest ransomware stats. See how Endpoint Security takes on ransomware and other malware. Malware is sneaky and relies on users being unaware of what they’ve downloaded to their devices—if they only knew. 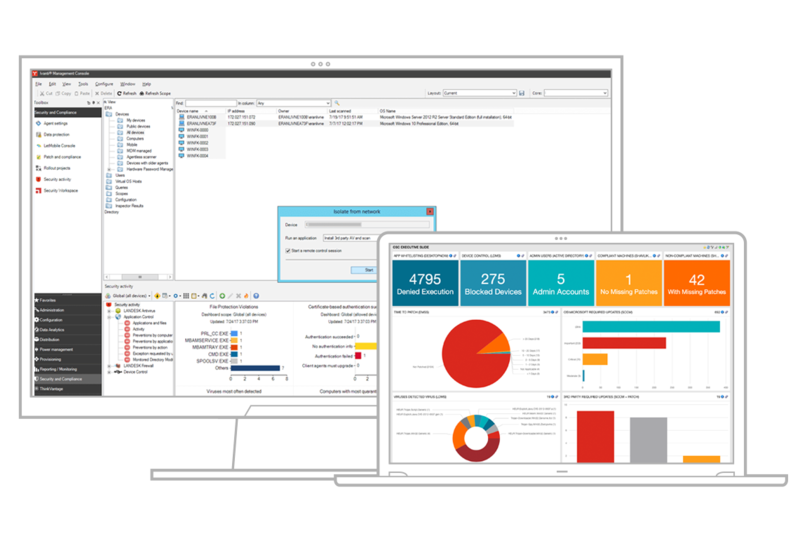 Enter Ivanti Endpoint Security for Endpoint Manager, powered by Landesk. Powerful endpoint security management—media protection, isolated device remote control, security diagnostics, flexible dashboards and reporting, and more—with app control and automated patch management. Detect and prevent threats before they impact you, and respond swiftly to infections. Give your team the tools they need to be immediately effective at saving your company’s data and reputation. All it takes is one user who clicks the wrong link or downloads a malicious attachment, and... well, you know the rest. Users will be users—so improve your security posture without disrupting the things they really should be doing. Gain insights about your environment, get help detecting security incidents, and take swift action automatically. Locking down users’ endpoints is not your only option for defense. When you can't prevent malware attacks, you can quickly remediate those that do get through, protecting productivity. Collect and export data in all common formats, to tailor it to the needs of the auditor or compliance officer. Reduce your attack surface and improve your security posture quickly. 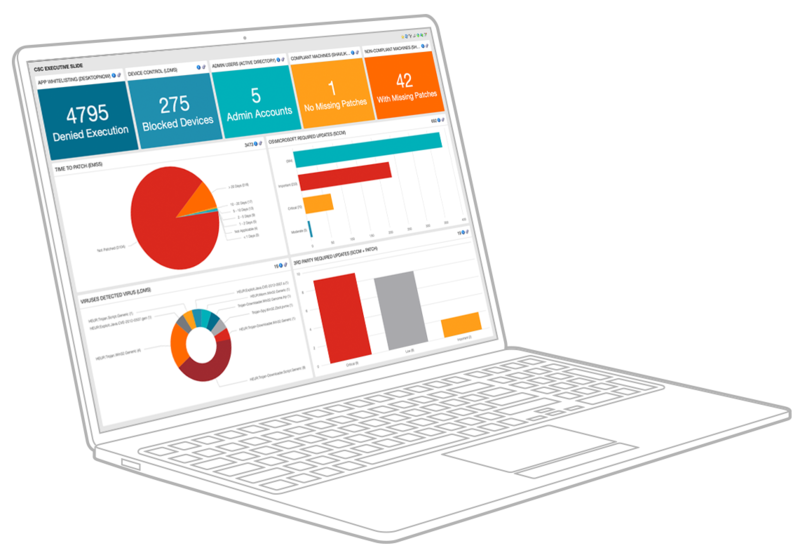 Get integrated security including patch management, application control and reports all in one management portal. You can’t secure what you don’t know about—discover it all. Isolate infected device, remote control it while isolated, and remediate or reimage to protect from ransomware or malware outbreaks. Update Windows, macOS, Linux, and third-party apps. Control which apps can run on your network. Also prevent multiple types of fileless attacks. Control what storage devices can connect to devices and provide logs for what is copied. Use Ivanti’s AV or choose another. Manage either from the same console. Includes dedicated ransomware protection. Visualize vulnerabilities and security-related activity. Improve security processes by managing Security, Patch, AV and Unified Endpoint Management together. Secure and manage endpoints from integrated workflows within a single console. See threats. Act on them quickly. Move on with your day. Attackers are always developing new ways into your network. Just assume you're in a state of continuous compromise and act accordingly. Get the added prevention, insights, and rapid remediation you need to minimize downtime. We're here to help with all your Endpoint Security for Endpoint Manager questions and get you to the next step. Deploy and manage proven security controls from within the console you know well. Get your quote today.